Global warming is real. Temperatures are changing, climate is changing, and most importantly, arctic ice is changing, melting. It is absolutely critical we understand this process better so that we can better understand the implications, and some of the most formidable tools in our possession are Earth-observing satellites. Their keen and unblinking eyes watch the planet below, recording a host of characteristics so that we may record their changes. NASA’s Aqua satellite view of ice swirling off the coast of Greenland. Click to enboreanate. Isn’t that lovely? But it’s also very useful to climatologists. 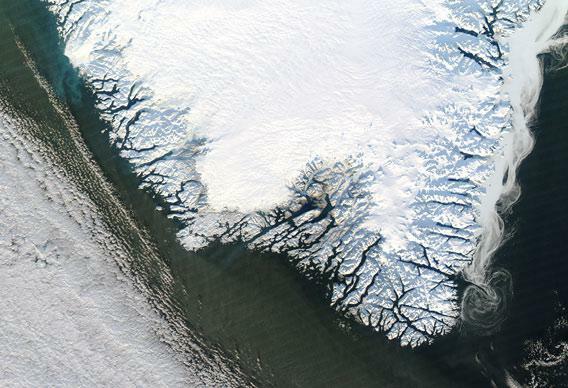 There are three types of ice visible in this image: land ice, covering the fjords on the coast; freshly fallen snow on the mountaintops, whiter and brighter than the land ice; and sea ice, which is swirling in the East Greenland Current, flowing southward and carrying frigid Arctic ice and water with it. Right now, in the depth of winter, the ice over Greenland and the Arctic is growing. But come March, when temperatures warm, that ice will start to melt. Over the past few years the melting has been larger nearly every year, with the extent (area covered) and volume (total amount) of the ice decreasing rapidly. In late summer 2007 the historical record for lowest sea ice extent was broken, and then in 2011 that record was shattered again. Last year, Greenland experienced a melting season unlike anything that has been seen in a long time; there were unusual conditions that led to this event, such as a large heat wave, but the overall trend is clearly not good. And the reason is very, very clear; global warming, caused by human activity. To be frank: there is no scientific controversy over this. None. The only arguing that’s being done is politically and ideologically driven, and we are way, way past the time when the conspiracy theorists and political climate change denial zealots should be taken seriously. They are in the same category as antivaxxers, creationists, and Apollo Moon landing deniers: The evidence is firmly against them, and all they can do is make noise and pollute the discourse. In the meantime, serious scientists are using data from Aqua and its sister satellites to log just how much damage is being done and where. If we come up with a solution to the mess we made and are still making, it will be through observations, through understanding, and through science. Our planet is profoundly gorgeous, and the only home we have. It’s big, but our impact upon it has had decades upon decades to grow and make itself felt. It’s about time we learned how to clean things up.